ROME – The new Prime Minister of Italy Mario Monti is spearheading the country’s drive to recover from its debt crisis, announcing the approval of a new austerity package aimed at boosting tax revenues and cutting government spending. 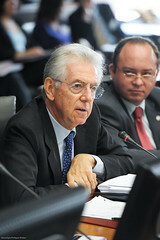 At a press conference given in Rome on December 4th the Italian Prime Minister Mario Monti said that the Cabinet has approved a new austerity package which will reawaken the country’s economy, and help Italy balance its budget as early as next year. The newly passed measures aim to trim excess government spending, cut down the occurrence of tax evasion, and give a boost to the economy. Cumulatively the austerity measures are worth approximately EUR 30 billion, which will consist of at least EUR 20 billion in budget cuts and extra tax collections. The Prime Minister said that the exact details of the austerity package will be revealed on December 5th when they are presented to both of the houses of parliament of Italy. However, Mario Monti did say that the package contains a new tax for the country’s highest earning individuals, and a 2 percent hike to the rate of the national value added tax. Also, a new tax will also be levied on taxpayers who own yachts, helicopters and other luxury assets. In an effort to boost country’s rate of employment, the new austerity package includes a measure to grant tax breaks to employers who hire young workers. In a simultaneous move to retain employees and lower superannuation costs, the national retirement age will also be raised. The government will also provide greater support and funding to sectors of the economy which have been lagging behind their counterparts in other countries of the EU for at least a decade. Italy will also see new rules aimed at helping the fight against tax evasion, with all transactions above EUR 1 000 now being required to be completed electronically.